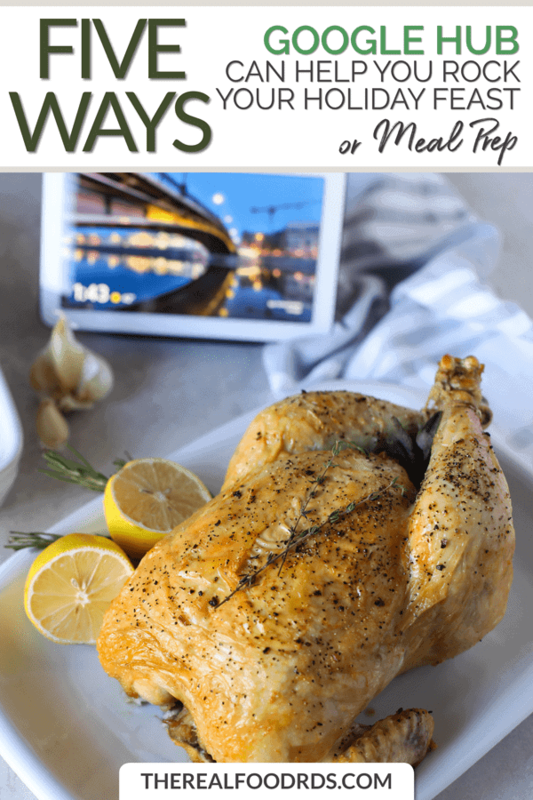 5 Ways Google Home Hub can help you rock your holiday feast (or meal prep)! Need an extra hand in the kitchen? 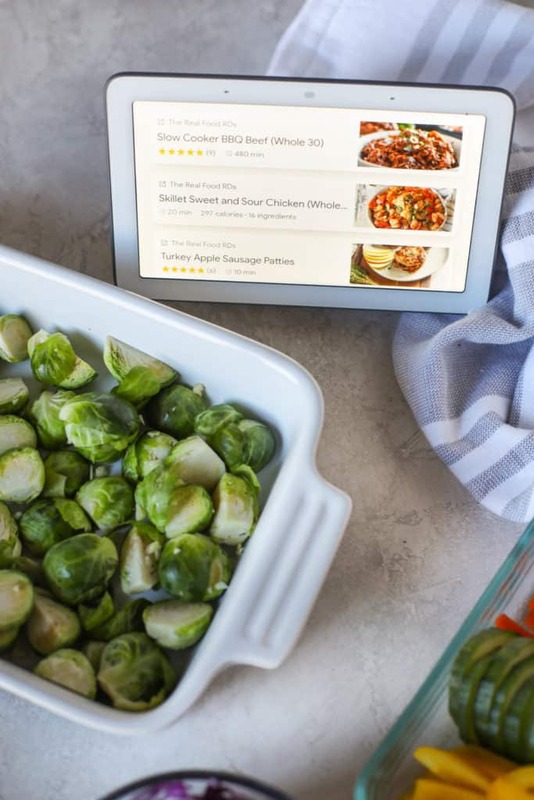 We’ve got 5 Ways Google Home Hub can help you rock your holiday feast (or meal prep)! This post was created in partnership with our friends at Verizon. Always so. much. to. do. As you already know, planning, shopping, prepping, and cooking is no small feat. Add to that the hustle and bustle of the holiday season, parties, potlucks, cookie exchanges, kids activities and you’ve got a recipe for overwhelm. Though we’d all love a personal assistant to take care of the menial tasks in life, for many of us, that’s not a reality. 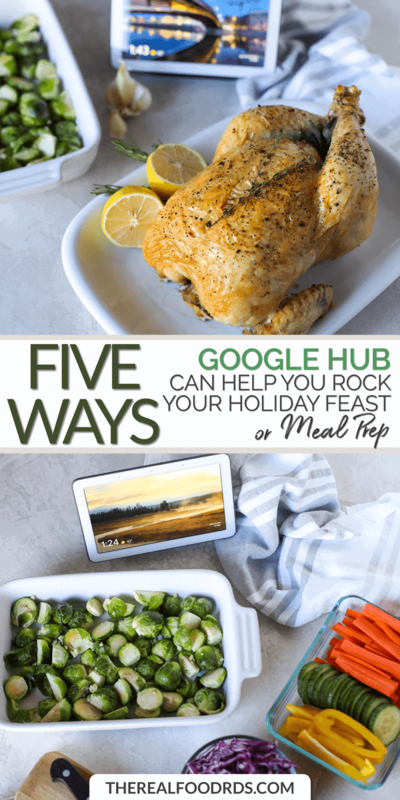 However, let’s not throw the idea of an assistant out the window just yet – because today we’ve got 5 Ways Google Home Hub can help you rock your holiday feast, your weekly meal prep or just get dinner on the table with less fuss. I spent the last few weeks with the new Google Home Hub smart display from Verizon on my countertop learning what it can do for me. Yes, it can tell me the weather, play my favorite music, tell me what’s next on my calendar and even remind me to take out the trash on Monday nights – all of these are great but what I most appreciated it for was how it made my time in the kitchen easier (and shorter). Create a grocery list – Put away the pen and paper. Now you can ask your Google Home Hub to add items to your grocery list for you. 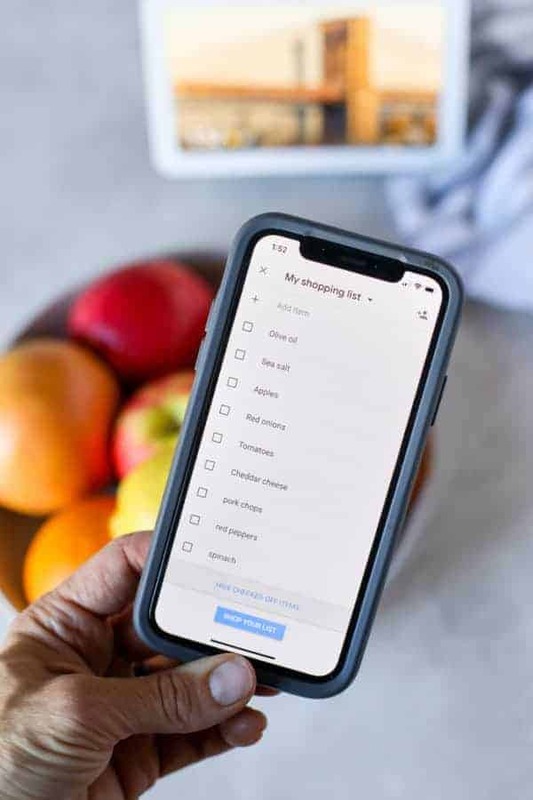 Using the Google Assistant app on your phone you can organize items by store and when you’re ready to shop you’ll have your grocery list in hand (or in your partner’s hand if you put the app on their phone too). No more running back to the store for this or that or losing your paper list somewhere between home, the car and the grocery store entrance. 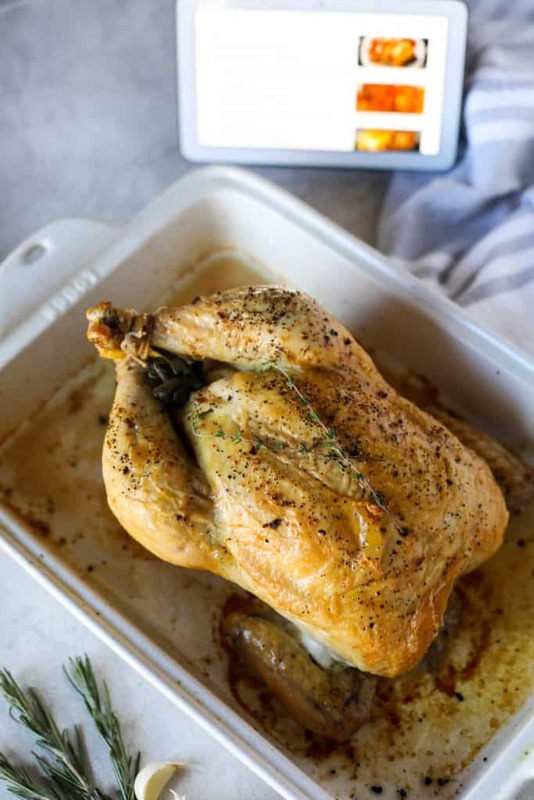 Search for your favorite recipes or find something new to try – You can find our recipes by asking “Hey, Google – Show me recipes from therealfoodrds.com” or you can search some of your other favorite sites for recipes you love. Not sure what to make what that package of ground beef when you’re short on time or in need of inspiration? 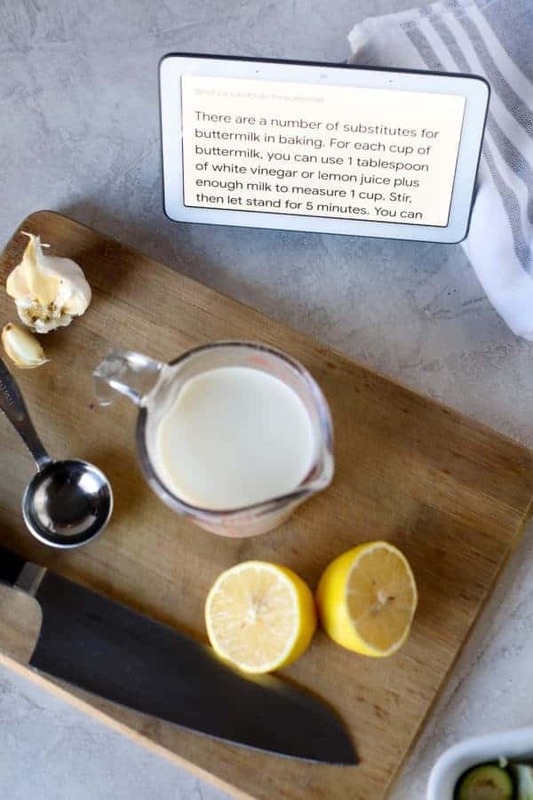 Google Home Hub can also suggest recipes it thinks you might like – or you can ask for something in particular. Instead of crawling the web for hours to find the perfect stuffing recipe, let your Google Home do it for you. Find substitutions or equivalents for ingredients – Are you out of baking powder or allergic to cornstarch? Just ask Google for a substitution. 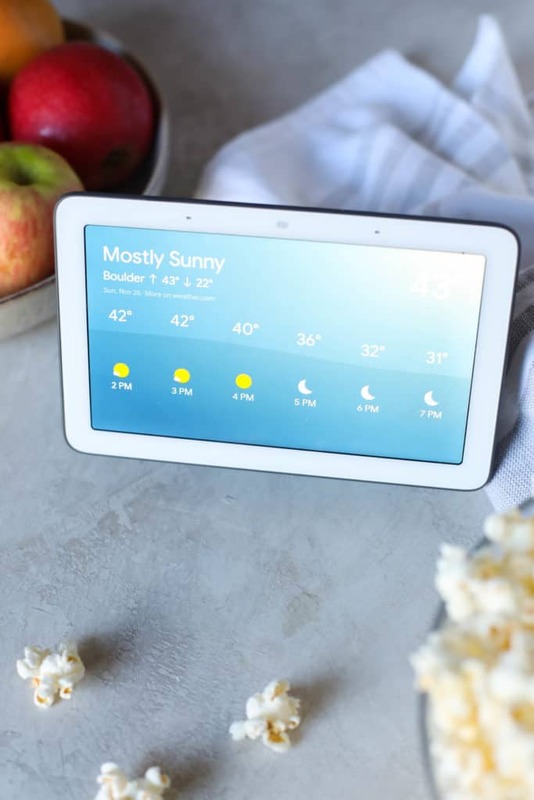 Your Google Home Hub will search trusted sites across the web to find suggestions for possible substitutions and show them on its crystal-clear 7-inch display. Making an apple pie but don’t know how many pounds you need to yield 8 cups of sliced apples? Ask Google Home Hub (in case you’re wondering, you’ll need about 2 ⅔ pounds of whole apples according to Google). Entertain your kids – or spouse! With several kid-friendly games to choose from you can keep the kids occupied and entertained while you cook together. Some of our favorites are This or That (which is like ‘Would You Rather’), Lucky Trivia for Families, Mental Math Games, and Freeze Dance. But if dancing and games aren’t your thing, Google Home can tell your kids a story or tell silly jokes while the nibble on a snack after school or while taking a break from homework. Order pantry staples – Use your Google Home to order household supplies and pantry staples from your favorite stores. Your Google Home Hub will give suggestions for items you ask for if you haven’t ordered that item before. If you have though, you can tell Google Home Hub to reorder the exact item or items. Don’t worry, your kids won’t be able to order thousands of dollars of Legos or Hatchimals because Google Home only takes this command from the person (or people) who’ve used the Voice Match feature to learn the unique sound of your voice. Bonus: If all else fails, you can make reservations at your favorite restaurant or order a pizza. We get it, life is busy and sometimes even the best meal plans fall to the wayside so on those occasions when you decide to trade in your chef knife for chopsticks or a greasy cardboard box then Google Home Hub can help with that too! Some other things I didn’t mention that I love about the Google Home Hub are that I can play my favorite songs on Pandora by simply saying, “Hey, Google – Play (insert favorite station here) on Pandora”. Or I can say, “Hey, Google – Tell me about my day” and hear the weather forecast, what’s coming up on my calendar and even the highlights from NPR while I feed the cat and make coffee each morning. I really love its Ambient IQ technology that automatically dims the screen when the lights are turned down at night and when I walk into the kitchen in the morning I’m not met with a glaring white screen. And when I mean dim, I mean dim. The Google Home Hub’s Ambient IQ technology actually matches the screen to the surrounding area so if you put it in your bedroom, the clock would be barely perceptible. There are so many things that the Google Home Hub from Verizon can do, this is just the tip of the iceberg. For homes that are equipped with smart light fixtures and plugs, turning off the lights or turning up the thermostat is just a voice command away. You can even add photos to Google Photo and enjoy the display as a digital photo frame, enjoy videos on YouTube (like knife sharpening, turkey trussing and carving or just silly cat videos – the world is your oyster with just the command of your voice or a swipe of your finger). 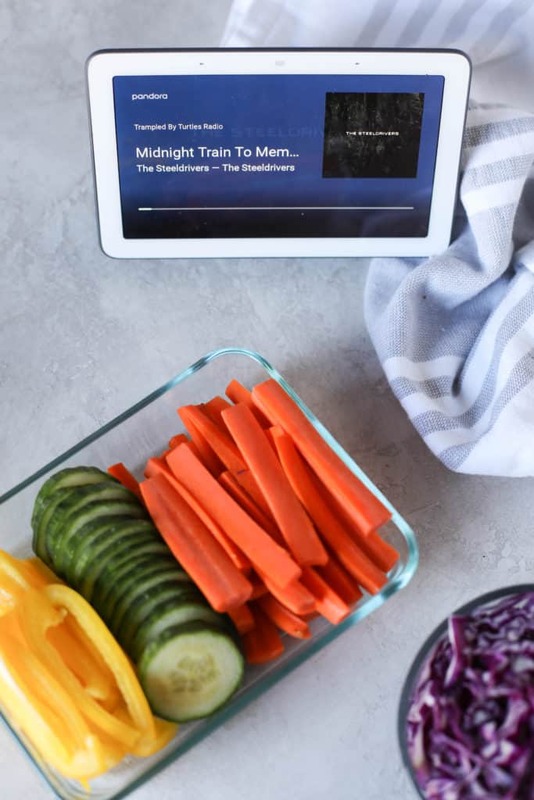 This holiday season isn’t going to be any less busy than the last so why not employ the help of a Google Home Hub in your kitchen to help you rock your holiday feast or your next meal prep? Think of it as the assistant you’ve always wanted but with a much lower price tag who doesn’t mind working nights, weekends and holidays. Have you tried a smart speaker or display in your kitchen? What are your favorite features? Share in the comments below. This post was made possible by our friends at Verizon. Although we received compensation for this post, the opinions expressed here are – as always -100% our own. Thank you for supporting the great companies we work with thereby allowing us to continue creating great recipes and content for you.